Katie is a good name. I like every Katie i've ever met, honestly. But I especially like this Katie. She is such a gem and honestly one of the most heartfelt and genuine people i've ever met. and she's just downright gorgeous. 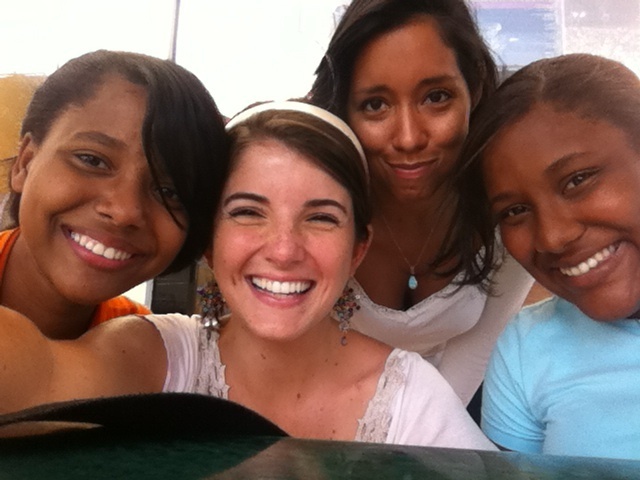 She's been living in the Dominican Republic this past year, lovin' on people and sharing about her love for Jesus. Every time we skype, she always has some crazy story of God moving. and i'm always madly encouraged! You can check out her blog here. So today, she'll be sharing a story in my series "stepping-out diaries". Maybe the biggest lesson the Lord has been teaching me this year over and over and OVER again is that my life, my faith, and my salvation have absolutely nothing to do with me and everything to do with HIM. Now, I've "known" this for years, but I don't think this truth has penetrated my heart like it has begun to do this year while I've been living as a missionary in the Dominican Republic. Over and over again the Lord shows me that everything is about Him! It's always been about Him! And thank GOD it is! All God asks of us is that we step out in faith, and He is faithful to do the rest. Here's just one story of how that has been true for me this year. 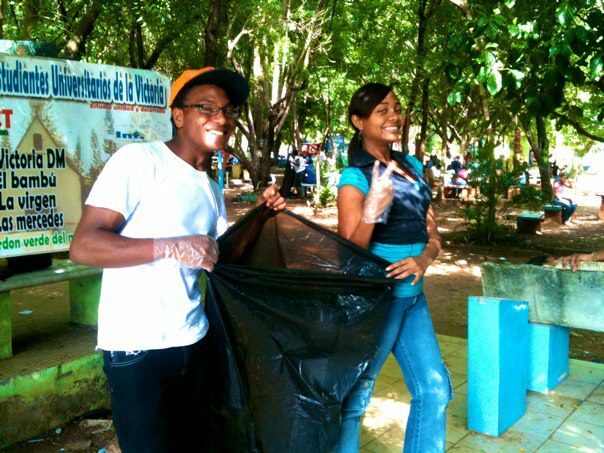 Earlier this year, we were having a campus clean-up event, where we were picking up trash around one of the most popular areas to hang out on campus. Now, I know this sounds like a sweet idea, but did I mention I live in a third-world country? There. Is. Trash. Everywhere. It lines every street. It perfumes every breath you take. I can't tell you how many times I have nearly tripped over rats that are devouring the trash while on my way to campus. 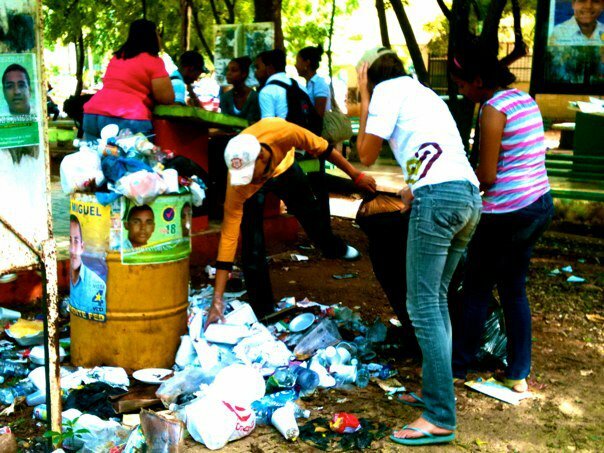 Needless to say, I thought this whole trash-pick-up outreach thing was a really stupid idea. So I came to the outreach in a bad mood, probably due to my pride and my I-know-better attitude, and probably because of some other reasons that I can't remember right now (maybe I tripped on another rat, who knows). At the outreach, I did the duties expected of me with half the effort that I could have, and then I sat on a bench with a friend to chat away the rest of the time. Then one of our students came up, my friend Anthony, and asked me if I wanted to go share the gospel with him to some of the students sitting nearby. The truth? I didn't want to. I didn't feel like it. I was in a bad mood, and the Spirit can't really work through me unless I'm feeling super spiritual right? Well, thanks to what God has been teaching me over and over again this year, I knew that wasn't actually true. So I said sure and as I started to walk with him I prayed that the Lord would change my attitude and use me despite how I felt. In short, we approached a girl who told us that God had been beckoning her for the past few months, and that she knew He was calling her to allow Him into her life, as Lord. We were able to help clear up the misconceptions of what it means to follow Jesus (the culture here is extremely legalistic and works-driven) and she made a decision that day to give her life to Him. I was completely humbled and filled with joy that God is a God who uses us in our weakest moments to rescue His people from darkness. Again He was showing me that it's Him that does the work, our only part is to choose whether or not we want to be a part of it. I think back to what would have happened if I wouldn't have said yes when Anthony asked me. Would that girl have met Christ? Absolutely. I know that God doesn't need me specifically or anyone else for that matter, and He will stop at nothing to bring His people to Himself. But would I have missed out on that literally life-changing moment for one of God's precious daughters? Absolutely. I would have stayed wallowing in my bad mood instead of allowing the God of the UNIVERSE use me to be His messenger. Thanks for sharing Katie!!! It's been fun to read all the other people's writings! Can't wait to see you guys when you get back!